If you are in the market for an Oral-B electric toothbrush, the chances are you have seen various different models but do not know what the differences are between all the different modes. Do not worry, we were once as confused as you might well be now. Let us explain what the different cleaning modes are and what they can do for you. There’s also a handy comparison chart further down the page showing you which brushes have which cleaning modes. There are up to 6 different cleaning modes available on Oral-B brushes. Which cleaning modes each brush has differs. The more cleaning modes, typically the more expensive the toothbrush. This is the standard mode for daily mouth cleaning. The cleaning cycle lasts for 2 minutes; 30 seconds for each quadrant. Each Pro series brush has a timer built in which will give an audible tone via a pause in the brushing at 30 second intervals and then at the end of the 2 minute cycle. The Cross Action, Floss Action, TriZone or Precision Clean brush heads are suitable for this cleaning mode. Suitable for those with sore or inflamed and even bleeding gums. It offers a gentle massage of gums to stimulate blood flow and strengthen and nurture the gum tissue. 2,600-10,500 oscillations and 12,000-48,000 pulsations (subject to model – see power delivery). A gentle, yet thorough cleaning for sensitive areas of the mouth, this mode is also recommended by some dentists as a better option than the Daily Clean as it is not so powerful. 6,500 oscillations and 30,000 pulsations. The Sensitive brush head is most suitable for this cleaning mode. Aims to polish teeth to give that dentist clean look and feel for brighter teeth. Suitable as an occasional or everyday cleaning mode. The cleaning cycle lasts for 2 minutes and 20 seconds normally. The first 2 minutes are for completing the normal cleaning and the additional 20 seconds for focusing on the front teeth. Each Pro series brush has a timer built in which will give an audible tone via a pause in the brushing at 30 second intervals and then at the end of the 2 minute and 20 second cycle. With the Pro 6000 and 6500 brushes you can extend this even further to focus on the front and backs of the rear teeth. 6,100-10,500 oscillations and 28,000-48,000 pulsations (subject to model – see power delivery). The 3D White brush head is most suitable for this cleaning mode. This is cleaning mode is the same as the Daily Clean but pre-programmed to last for longer. The cleaning cycle lasts for 3 minutes; 45 seconds for each quadrant, compared to the standard 2 minute clean and 30 second intervals. Each Pro series brush has a timer built in which will give an audible tone via a pause in the brushing at 45 second intervals and then at the end of the 3 minute cycle. 8,800 – 10,500 oscillations and up to 48,000 pulsations (subject to model – see power delivery). Used for cleaning the tongue or inside of the cheeks. More gentle than a conventional cleaning mode. Suitable for daily or occasional use. The cleaning lasts for 20 seconds. The Sensitive brush head is advisable for this mode. 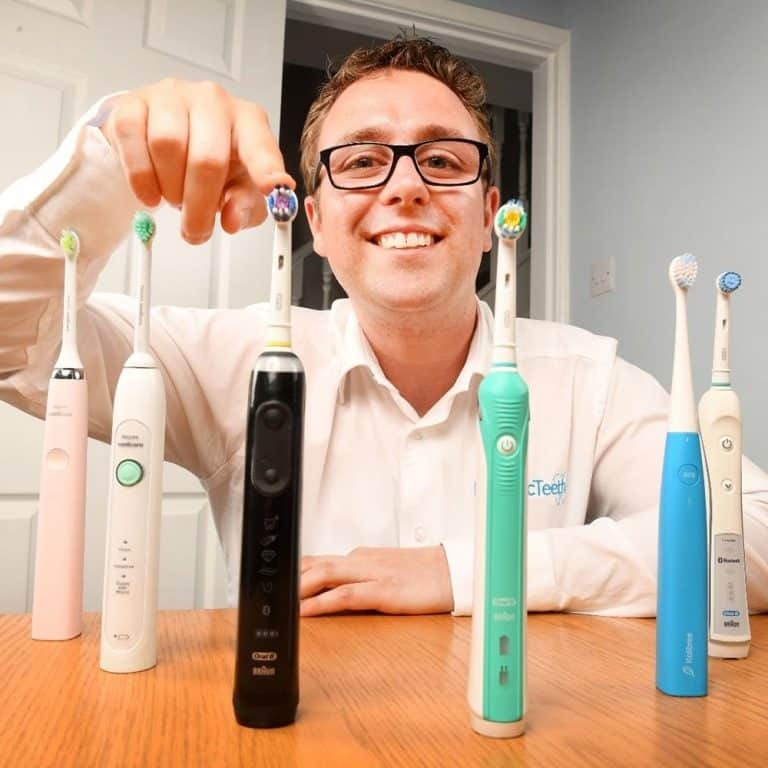 Unfortunately to make things just a little more confusing different brush handles within the Oral-B range are able deliver a different number of oscillations (side to side movements) and pulsations to the brush head. As you progress through the Oral-B range, it is the more premium brushes that deliver the most power and the larger number of oscillations and pulsations. The most basic Oral-B power toothbrush. Essentially a bridge from a manual to a power brush, so this may be a good choice for people new to electric toothbrushes. This is the bridge between using a gentle power toothbrush to the standard power brushes. The most powerful and capable brushes in the Oral-B range. As a result of the different power settings of the brushes, the maximum number of oscillations and pulsations does vary. This does make some difference to the clean, but not a massive difference, so do not be too concerned about having to have the most powerful brush available. Just cleaning your teeth regularly and with the correct technique is a big step forward in ensuring healthy teeth. There are specialised brush heads some of which are designed and suited for particular cleaning modes. You can use the standard cross action for all cleaning modes, but the 3D White brush head is more effective when used with the Whitening mode. The choice is of course yours but it is advised to use the appropriate head to gain the maximum effect from each cleaning mode. Whilst the different cleaning modes vary between brushes all are accessed via the power button or by pressing the cleaning mode button on each brush. Some brushes have a Smart Wireless Guide included and on this an icon is displayed to identify the cleaning mode in use. Whilst some seem obvious others are not. The following image shows what the icons will look like on the smart wireless guide. Do be aware that the Massage mode is also known as Gum Care mode. Which brushes have which cleaning modes? To make it easy to find brushes with a particular cleaning mode we have compiled the lists below. We also link to our review of a brush, and we link to its listing on Amazon in case you want to buy. We also recommend checking out other retailers, but Amazon is our go-to recommendation as they are often the cheapest. To avoid repetition, we have only linked to the review/where to buy the first time it is mentioned. Which brushes have daily clean mode? Which brushes have gum care mode? Which brushes have whitening mode? Which brushes have deep clean mode? Which brushes have tongue cleaning mode? How can I compare the brushes? For a simple no nonsense comparison, consult the comparison table below which shows you the key difference between each of the main electric toothbrushes within the Oral-B Pro series range. For more detailed hand on comparisons, see our written ones here or check out our YouTube channel page for more. Leave a comment below if there is something you need answered. Hi, I have the oral b 8000 and I noticed that when I try to brush my back teeth where my wisdom teeth where removed the brush likes to stop and go. It’s quite difficult to get far back in my mouth and I need to apply pressure to clean my exposed teeth as my gums still haven’t filled in at the top where my wisdom teeth where removed. Is there a way to turn or pressure sensing. I believe the pressure sensor is causing the toothbrush to stop spinning when I try to deep clean these two teeth. I like to get all of the surroundings and I get quite frustrated when my toothbrush keeps stopping. I have a pretty small mouth so its a hard to reach area. I have trouble flossing those two back teeth b.c of my small mouth and my TMJ which causes my jaw to lock if opened too far. I even got my first ever cavity b.c of it. I’m 28years old and only just got my first cavity. I removed my top wisdom teeth at 25yr old. They were impacted. Only born with the top two. When you say the brush likes to stop and go, is the brush head no longer moving at all or it does, but just slower? Does the red light below the brush head shine when this is happening? If the red light is coming on and the brush head is moving slower, it is the pressure sensor, which to my knowledge cannot be turned off. I understand the need to clean this area as best as possible, but brushing too hard is not advised. You may want to speak to your dentist, but you may find some specialist tools like a TePe right angled interdental brush may work better for you if space is very limited. Hi. I have Oral B pro 6000N. I don’t understand is it possible to clean me teeth with Gum care mode or this mode is ised only tomassage my gum? Which mode is more gentle to my gum – Sensitive or Gure mode ? Can I use sensitive brush head with Gum care mode and can I use crossaction brush head with sensiteve mode? In which country did you buy the Pro 600N from Oral-B? The reason I ask, is because in the UK, the Pro 600 only comes with 1 cleaning mode only, Daily Clean mode and not the sensitive or gum care modes you mention. In other countries around the world, this may well be different. However, in answer to your question, you can clean both your teeth and gums with any cleaning mode. The idea behind the Gum Care mode is that it has a different number of brush head movements. The brush head gets faster and slower during the clean, to massage the gums and stimulate blood flow and help to make them healthy. The Sensitive cleaning mode uses just one consistent speed, but this is less than the normal Daily Clean mode. You can use any Oral-B brush head on any cleaning mode. Hi. I’ve bought a Smart Series 6500 and cannot find the gum care mode. When pressing the mode button it moves through the first 4 options (daily clean, deep clean, sensitive, whitening) then back to daily clean, missing out gum care and tongue cleaning completely. I bought this device specifically for gum care. Would really appreciate your advice. Many thanks indeed. 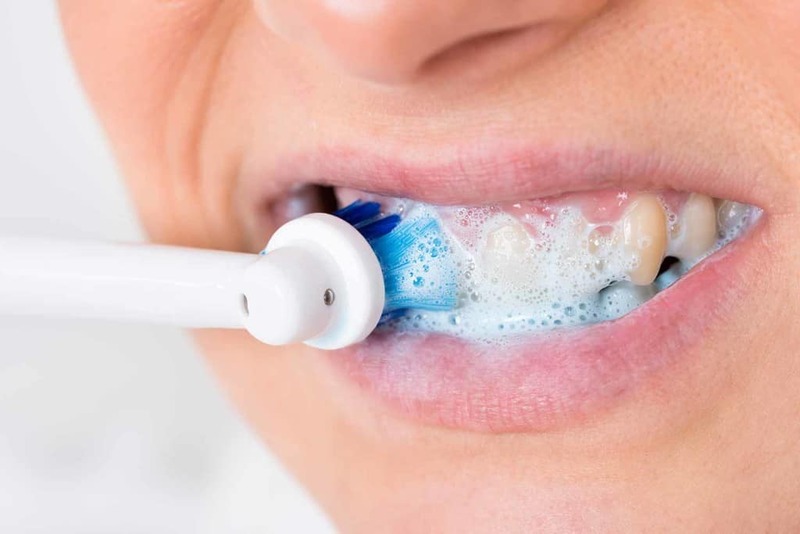 Have you connected the toothbrush to a smartphone using the Bluetooth connection? I suspect you might have and in doing so selected a particular ‘journey’ that may have disabled this mode. There is an option within settings to re-enable this. I can advise how to do this, but first, please let me know if you have made this pairing between brush and smartphone. I’ve just bought a PRO2 2000W with the 3D whitening heads ( I didn’t know there were so many different ones). I have several crowns and I’m wondering if it’s safe to use this head on them or if I would be better with the cross head type brush. Do you have any information on this please. Perfectly fine Linda to use either on crowns. I’m not too interested in all the fancy modes and app help, as I’m quite a thorough brush-er already. I am interested however as to making the brushing even more effective with a more powerful toothbrush. I have not created a chart. However if you scroll down to the ‘power delivery’ section of the article, there is a bit of explanation, which I hope will help. Only the top end brushes (genius range) are more powerful, but the reality is the extra power will not make significant or noticeable differences in most cases. When you say stop, do you mean stop completely and turn off? Or, does the brush head motion slow down and then speed back up again? Hi. I have Smart series 6000 with 2 toothbrushes, but on one I can only choose 2 out of 5 modes and that is Daily Clean and Whitening. It sounds to me like that brush with only Daily Clean and Whitening available has been paired to a smartphone. Within the Oral-B app a ‘journey’ or particular cleaning setup has been configured, which disables the other modes. Or the modes have been manually disabled within the settings of the app. Is this possible? If you connect the brush to the smartphone again, from within the app you can disable this journey and/or change the settings restore the cleaning modes. Thank you very much, I did not know that the ‘journey’ disables some of the modes. Also I saw that through the app it is possible to manually disable modes. I have an older Oral B Triumph model. Still works very well but wondering if I am missing out on extra cleaning benefits of these newer models. Would you recommend upgrade? and why? If you triumph models is still working well then I see little point in upgrading. Yes, the motors in newer models are a bit more powerful but to be honest the differences are not considerable enough to warrant an upgrade for most people. I would suggest waiting until the brush fails or is on its last legs as it were before upgrading. Hi John, no, the Pro 2 2500 from Oral-B is not an ultrasonic toothbrush. For more information check out our here. I bought the PRO2 2000W brush which mentions 3D WHITE on the box. What exactly is the meaning of this, given the brush doesn’t appear to do “Whitening Mode”?? You should find that the brush head provided with the Pro 2 2000W is the ‘3D White’ brush head, which has a polishing cup to help make the teeth whiter. There is no whitening mode, but the brush head can help. Thanks for this – OralB electric toothbrushes seems to be a total minefield! The head that came with my Pro 2 2000W has a pink centre – is that a “3D White” head, and are you supposed to fill the cup with “whitening” toothpaste? Also, whilst having someone to answer all my questions, (thank you) what is the 2000 about? The assistant in Superdrug yesterday said it was to do with the number of revolutions of the head. Is that correct? There’s a lot of difference between 600 and 3000! The Pink (older versions were yellow) centre is the 3D White brush head. The assistant in Superdrug is very wrong! The name has nothing to do with the revolutions. A quick reference list of differences is available here. That image comparing the brushes I link to does not have the revolutions of the brush head listed, as this is more info than most need or care for. The Pro 2 2000 is more powerful than the 600, but the same as the 3000. The Pro 2 2000 that you have offers up to 9,900 oscillations and 45,000 pulsations per minute. More than enough cleaning power there. Happy to help if you need further assistance. Both my husband I use the Oral B Smart 6 & we have each downloaded the app & linked our phones to it. I use the gum care mode & my husband uses 3D white, but how the the toothbrush recognise what mode to use for each person? Do we press the down arrow on the handle to change to our individual modes? I can’t find anything in the instructions regarding this. Any advice would be much appreciated. This is disappointing and a feature I do wish Oral-B and Philips Sonicare addressed with their Bluetooth connected models. To achieve independent cleaning & tracking, what you and your husband appear to want, you will have to have your own toothbrushes, each connecting to your individual phones. Sadly, I doubt this is the answer you wanted to hear. If you need more information or have any questions, please let me know. I have the oral b 9000. Day 1 and quite impressed. However, I quite fancied trying the deep clean as a one off just now (and maybes once a month) but the options are locked to “whitening”, it seems the only way to change this is to reset the handle.. Is that correct? The most likely reason the brush is locked to whitening mode is because a ‘Whitening Journey’ has been set within the Oral-B application on a smartphone. Did you pair the brush to your phone and set this? There are too options within the application settings to enable and disable modes, so this might also be why it is locked. You can edit the settings and make the change. If you need further assistance on this let me know. In regards to the brush heads, it can get complicated. Some are best suited to particular modes, but any can be used on any mode. The following video gives a brief overview as to why this is and the differences, with a full detailed explanation available here. You are right, I did choose a whitening journey but I didn’t think it locked it at that and not let me access the other options. Thanks again – and for the record I only found this site last night and it has been great to read through some of the articles. Well done. 3 minutes is more than enough time for brushing. Dentists usually advise 2. No need to brush for longer than 3 though as you won’t be achieving much more cleanliness! Glad you have found our articles helpful. Perhaps when you have spent a few more weeks with the 9000 you can share your thoughts with us. Always good to hear what people think of brushes. Hi i have oral b 5000. I dont kno how to use the modes? Do i need to change the head for the changes? You do not have to change the brush heads to change the cleaning modes. There are several models of ‘5000’. Depending on the specific model you have you will either have to press the power button multiple times to change the mode or there may well be a separate button (under the power button), with a downwards facing arrow (>) that you press. I was looking at purchasing the 9000 as recommended by my dentist. However after reading your Q&A’s I’m wondering if I should spend that money? I want Daily Clean, Whitening, and Massage features. Can the latter be done with the Daily Clean option. The answer to the question is influenced a little by personal opinion and your needs. ‘Whitening’ can come as a result of using only the Daily Clean mode and a good toothpaste, you don’t necessarily ‘need’ the Whitening mode specifically. You might want to consider the Oral-B Smart 4 4000 that offers these modes. However, subject to the price as and when you come to buy the Genius may work out better value. Hi Deborah. Strange you have no timer at all. DOes anything happen at 30 second or 2 minute intervals? Have you been using the Bluetooth connected app? Perhaps changed some settings here? If you can give a little more info and I will do my best to assist. I have a Genius 900 and somehow managed to switch from professional mode to 2 Mon timer and can’t get it to switch back tried following instructions in the manual but can’t get it back to professional what or where on the toothbrush brush is the led’s I should be looking for? Sue, If you are following the instruction in the manual then the mode should change. selection by pressing the mode button. If this is not working, you can also set/advance the timer functionality via Oral-B App. I wanted to buy my first electrical tooth brush. I wanted to ask does whitening result with 600 is as same as advanced model which have 3D whitening mode. I really don’t need all features that advanced model offering. I need just daily clean and whitening. You will get some benefit from using the 3D White brush head on the Pro 600, but the Whitening mode found on more premium models does offer some extra advantages because the power settings are changed on that cleaning mode compared to the Daily Clean mode on the Pro 600. The actual difference in use might well be harder to tell though. The best value brush that offers both the normal Daily Clean mode and a Whitening mode is the Oral-B Smart 4 4000, available here. Hi, we used the app to establish a pre-set mode, and now the modes won’t switch on the brush. We’ve uninstalled the app but no change? is it possible to reset to factory settings? The easiest way is probably to install the app and connect the brush to the smartphone again. Within the app, check the settings as there is an option to reset the handle and you should then be all set. I have a dental industry promo (white boxed) “genius” not labeled genius 8000. It does state 12 day battery life but should I believe it to have the oscillating and pulsating power of a true genius 8000? As far as I know or understand, the dental promo versions have the exact same power as the retail units so I believe it would be right to believe it has the same oscillating and pulsating of a Genius 8000. Hi I have just bought the Oral B PRO.6000. How do I Set the Mode with out the Oral B App? The brush should have a cleaning mode button (a downward arrow) that allows you to change the cleaning mode. Does that help? How do you know they have not fully charged, because the White light does not go out/switch off? Perhaps try running one and see how much run time/days usage you get from it. i don’t need a toothbrush to tell me anything. especially how long to brush my teeth. let alone a bothersome quadrant timer. how can you disable every “smart” useless feature on a oral b 6000 and turn it into a manual, buttons only practical electric toothbrush. If you don’t need all of these features, maybe looking at a more basic electric toothbrush is an option for you. Perhaps something like the Oral-B Pro 2 2000 might be a good choice. You can’t disable all of the features, but you can turn the quadpacer off and have just a 2 minute timer. Head to page 8 of this user manual for details on how to change the timer on the brush. Hi there I’ve just had the Oral B 8000 for my birthday which I love! My teeth have never felt so clean. The question I have is I have set it on the whitening journey but the mode it uses is daily clean. I didn’t notice this for a few days and then when I changed it to whitening mode the app was telling me to change the mode. Is this correct? Would I get better results by ignoring it and switching to whitening mode? Also from reading the posts you mention it should tell you to move to the next quadrant. Mine doesn’t. Is this becayse of the whitening journey programme? If you have setup a journey the app will complete a lot of the configuration for you. It will tell you what cleaning modes it will leave available for use. The modes it selects will depend on the configuration of the journey and your personal settings that have been configured. Just run with what it sets up for you as it has been specifically designed this way to achieve the best results. It is correct that the timer/pacer has been disabled as part of the whitening journey, when you set this up within the app it should have made you aware of this. Good luck, I hope you get the desired results. Thank you for your reply. I’ll stick with the daily clean as it suggests then. It seems to be working as one week in and my teeth are whiter already. Brilliant, good to hear Helen. Just purchased the oral b pro 2000, after the initial two minutes cleaning the brush continues to run. I expected it to automatically switch off, I’m actually having to switch it off manually. Is this correct? Yes, this is correct. The brush does not automatically turn off. This is not a feature Oral-B offer. Sonicare and Colgate brushes do. I somehow turned off the pulse every 30 seconds. How do I turn it back on? Do you know which model of brush you have? Thanks Matt. There are different versions of the 5000 around the world. Press and hold the brushing mode button for 3 seconds until the SmartGuide shows «:30» and «timer». Briefly press the on/off button to switch to the «2-Minute» timer. Push the mode button to confirm. If your rush is a Bluetooth connected model look at the app settings as you should be able to control from here. What brush head do you recommend for the daily clean ? Stacey, If you want only that mode, then the Oral-B Pro 600 has you covered. Can the quadrant timer be turned off? If not, is there any model that doesn’t have a quadrant timer, or has one that can be turned off, and which is the best of those models? If not, which other brand of power toothbrush would you recommend? Yes, the quadpacer/quadrant timer on the Genius 8000 can be turned off. On the brush you can choose between “Professional” or “2-Minute” timer. The “2-Minute” is the mode that you want, this does not have the quad pacer activated. I have a Oral B 9000. Some modes doesn’t work like daily clean+, sensetive mode and massage mode. Have you set a programme within the app, such as Whitening? Some modes get disabled or can be via the settings of the app. Take a look and see if you can re-enable them. No problem, Glad it is now working. It’s there a way to turn off the pause-every-30-seconds creature? It is very annoying. I would prefer to time myself. It might be. Do you know what model brush you have Beckie? This is what it has on it: Braun OralB, Triumph Professional Care, type 3762. Thanks but sadly that does not give me enough information to say for sure and models around the world differ. If your brush has a wireless smart guide, you could try this that I have taken from an Ora-B manual. Timer – You can choose between «2-Minute» or «Professional» timer and «Count up» or «Countdown» timer. The «2-Minute» timer signals with four beeps and a Smiley on the SmartGuide that the dentist recommended 2-minute brushing time has been reached. beep indicates completion of the first quadrant, two beeps the second one, three beeps the third one and four beeps sound when you reach the recommended 2-minute brushing time. during pause. The «Count up» timer displays your actual brushing time. The «Count down» timer indicates the remaining brushing time. Personalizing the timer – Your toothbrush comes with the «Professional» and «Count up» timer activated. To change this, press and hold the brushing mode button for 3 seconds until the SmartGuide shows «:30» and «timer». Briefly press the on/off button to switch to the «2-Minute» timer. Push the mode button to confirm. The SmartGuide now shows «up» and «timer». Press the on/off button to switch to the «Count down» timer and confirm with the mode button. Leave the setup menu by pressing the mode button. Hi there, I have just purchased my new toothbrush (can’t wait for it to arrive). I will be using the gum mode, I have what might be a silly question but have never had an electric toothbrush before… Do I use the gum mode after I have brushed my teeth ‘normally’ using the daily mode? And when in gum mode do I actually use the brush on just my gums? Thanks. Normally, you would use the ‘Gum Mode’ in preference to the normal ‘Daily Clean’ mode. So brush your teeth as you would normally, just with ‘Gum Mode’, you need not brush only your gums. There is nothing stopping you switching between the two modes and using a combination of, but normally users will stick to one mode. Gum mode will last for 2 minutes and operate at a different speed/power to the Daily Clean mode. If you need more assistance, please let us know. What brush have you gone for? Do all of the pro models contain the same internal battery? The Pro 600, 650, 2000, 2500, 3000, 4000, 4500, 4900, 5000, 5800 all share the same battery Anthony. Hi can u us the 3D white brush head on the oral b 3000 all the time or with it being a whitening brush will using it all the time damage your teeth ? It is fine to use all the time. It will still do a good job, but for the best job for general cleaning the CrossAction is best in our opinion. The most important thing is to brush regularly! Hi. I am a guy from Denmark, looking to replace my old, worn electric toothbrush, when I discovered your channel on Youtube. According to you, you are not able, to feel a difference in strength, if you compare the “Daily Clean” function! This is different from, what one would expect, when you look at the specifications of the Pro 600-series vs. the Pro 2000-series and up, it says they pulsate at 20.000 rpm vs. 40.000 rpm respectively. In a review on this danish test: http://www.pricerunner.dk/bedst-i-test/eltandborster , they claim, that the Pro 600 compared to Pro 2000, feels like it has a bad battery, and that the motor included, simply does not offer the same strength! I agree, the design looks quite the same, and also the weight is very similar, but could it be, that the Pro 2000-series has a different and more powerful battery? I can confirm that this page will be soon updated to confirm that the Pro 2000 does offer more power than the Pro 600, we have obtained information that confirms this. These changed are pending, but have not been put live as yet. Despite the increased power of the 2000, I personally say that the difference is that considerable unless you compared the two side by side. Opinions on the feeling and performance are of course personal. So the Pro 600 is in our eyes perfectly acceptable. The 2000 is more powerful but I think it is harder to tell the difference. You may feel it is worth opting for this brush as a result of the increased power. It is not really until you then get to the much more premium models does the power step up ever so slightly again. As we understand it, the 3rd cleaning mode on the brush is sensitive. The order is: Daily Clean, Gum Care, Sensitive & Whitening. I have just purchased the Special Edition ‘Pink’ Pro2000 which has Daily Clean and Gum Care Modes. On the Box it say ‘3D White’ how do i get this mode as there is no ‘Whitening’ mode for the Pro2000? Or is this achieved by the 3D white head? – if so which mode do I use to achieve 3D White? Daily Clean or Gum Care or both? Sadly there is no whitening mode. This is a bit or a marketing ploy. The whitening is achieved by the brush head and not a specialised cleaning mode. Use the Daily Clean mode as this delivers more power and will help buff the teeth to a shine. If you want to help get whiter teeth, you could always try a whitening toothpaste to go along with your new brush. my brush has all the modes, but for some reason it has locked onto whitening and daily clean, and I could not change it to the other modes. It says I am on a whitening journey but I can’t seem to cancel or change it. What do I need to do to get back to the full range of different modes? Hi Lee. Which brush do you have? If you have a Bluetooth enabled brush you can lock cleaning modes from the app. THis might be what has happened here so you will need to edit these within the app, sync and hopefully return all modes to their original working condition. Is there much of a difference between gum cleaning and sensitive? What would you use the different modes for? Thanks for the questions. Very valid ones. We have answered this in another post, which explains the differences. If I may direct you to https://www.electricteeth.co.uk/oral-b-cleaning-modes-explained/ which answers your question in a way that is not quite so easy for me to do in the comments here. How do activate the timer on the oral b pro2500 pink ? This should be activated as standard out of the box. There is no on/off functionality for the timer to my knowledge. Can I use the 3d White head on an Oral-B Pro 2500? The toothbrush doesn’t have a whitening mode, but will the head achieve a similar result? My brush had the daily clean and gum cleaning setting . How frequently should I use the gum cleaning setting ? I assume I use it along side the daily clean – is that correct ? There is not a requirement to ‘have to’ use the gum care mode. It can be used in preference to or alongside the daily clean. For the best for you and your dental care needs, I advise speaking to your dentist for a professional opinion. Hi. I have the 6500 model but I can’t get it to go back to professional mode I.e. The 45 seconds each quadrant. Also the icons on the smart guide only show daily cleaning. Whitening and tongue cleaning. How can I get the other icons back. Help. Here is the procedure from the manual. Are you following this? 30 seconds or briefly pressing the mode button (d) during pause. Your toothbrush comes with the «Professional» and «Count up» timer activated. To change this, press and hold the brushing mode button for 3 seconds until the SmartGuide shows «:30» and «timer». Briefly press the on/off button to switch to the «2-Minute» timer. Push the mode button to confirm. The SmartGuide now shows «up» and «timer». Press the on/off button to switch to the «Count down» timer and confirm with the mode button. Leave the setup menu by pressing the mode button. You can use it as often as you like really, but most may only use it once or twice a week. You may want to seek advice from your dentist what is best for you and your personal situation. Hi, I have a pro 4000 and I’m not sure how to switch to the whitening mode. Hi Mike. Press the power button once to turn the brush on. Press it again to get gum care mode. Press it another time to get sensitive mode and press it a fourth time to get whitening mode. Therefore 1 press to switch on and then 3 more times to get whitening mode. Hi I have the 3D 4000 and I only seem to have three settings 1 wen I switch on and when I press three more times it turns off?? Can you describe the Journeys? In particular. 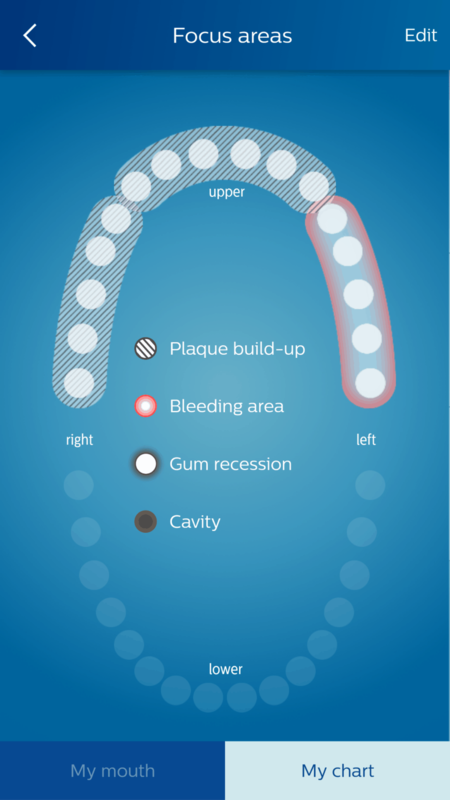 I’m on the “Plaque Fighter” Journey and unlike a normal brushing session where the toothbrush vibrates after 30 seconds (for each quadrant of the mouth – I’m guessing top right, top left, bottom right, bottom left), the brush vibrates after 20 seconds and there are six sections on the “Quadrant Circle”. I’m not sure how to divide my mouth into 6 sections. No problem on giving an explanation. There is certainly a way to split your teeth into 6 sections. See the image below to assist. Essentially you have top back left, top back right, top front, along with bottom back right, bottom back left and bottom front to get your 6 sections with 20 seconds spent cleaning each of the 6 sections. Where normally it is 60 seconds for the bottom teeth, with 30 seconds on the left and right, the way you split your mouth up now changes to cater for the rear and front teeth. We hope this helps. I have a pro-3000. How can i set the mode of brushing to “daily clean”, or “gum care” , or”sensitive”? When i press on the power button, the brush pulsates? to which mode this pulsating corresponds? Hi. When you press the power button it will launch into the ‘Daily Clean’ mode. Press it again and it will launch into ‘gum care’ and then another time for the ‘sensitive’ mode. Once more it will then turn off. No Ronald they should not.